This Beautifully decorated holiday home can accommodate 4 guests between 2 bedrooms that share 1 bathroom. 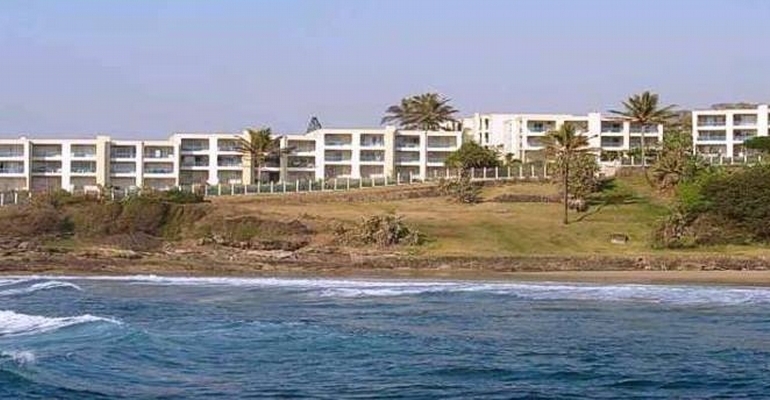 It hosts an open-plan, fully equipped kitchen leading to a spacious and comfortable lounge (DSTV connection point-please bring your own decoder), opening to a covered balcony overlooking the sea. The main bedroom has a double bed, the second bedroom has twin beds & and the bathroom has both a bath and shower. Laguna 173 is not serviced daily, but should you require, it can be arranged. There is secure under-cover parking for 1 vehicle and additional open parking with 24-hour security, and a swimming pool near the communal braai area. The complex also offers tennis courts and on-site laundry facilities. There are stairs leading directly onto the beach with a fishing pier, otherwise it is just a 5 minute drive away. Uvongo boasts several secluded beaches, superb fishing sites and beautiful scenery. There are loads of activities within walking or driving distance, but Uvongo is best known for its waterfall that plummets 23 m down, creating one of the deepest lagoons in the country. In the event of premature departure we will charge for the full original booking plus admin fee. Cancellation 0 -14 days before date of arrival, or no-show visitor forfeits 100% of deposit paid plus admin fee. Cancellation 15- 28 days before date of arrival , visitor forfeits 75% of deposit paid or 25% of full quote value (whichever greater), plus admin fee. Cancellation 29+ days before date of arrival – visitor forfeits 50% of deposit paid or 25% of full quote value (whichever greater), plus admin fee.